This print shows more early designs from the famous modiste Madame Lanchester, here still known as simply Mrs. Lanchester. 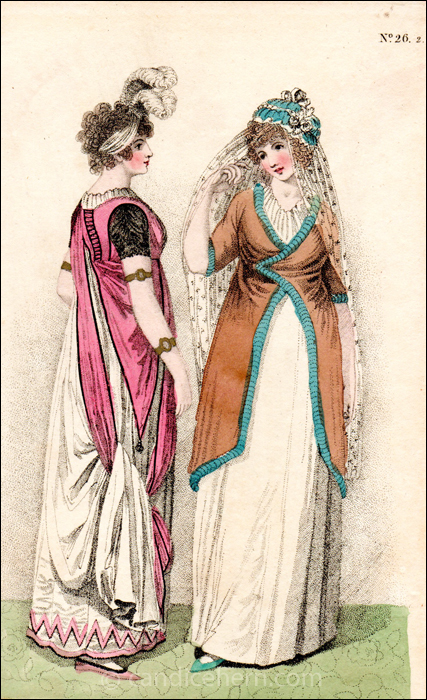 You can see more of her early designs in another print on this site, Walking and Riding Dresses, August 1800, from this same publication, and several later prints from other publications. The full dress shows one way in which a long train might be managed while dancing, which is especially interesting as trains are seldom depicted in prints as held or gathered or tucked. Note also the sets of bracelets on both wrist and upper arm. Bracelets at this time, and throughout the Regency, were typically worn in pairs. You see a hint of the second of the pair of bracelets on the upper left arm. The long veil shown with the morning dress may appear unusual, but is in fact not uncommon during this period. 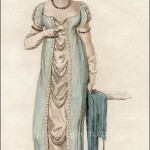 Long veils of white or black lace are frequently seen in prints through about 1806, with shorter veils seen in prints through the Regency period. It is also interesting to note that neither figure is shown wearing gloves. “Fig. 1. FULL OR DANCING DRESS. Body and drapery of pink muslin or crape, with a long train of white muslin, drawn for dancing through the pink drapery, sleeves of black lace. Petticoat of white sarsnet. A bandeau through the hair with ostrich feathers. “Fig. 2. MORNING DRESS. 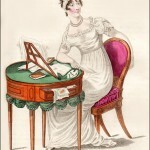 Round dress of thick white muslin, drawn close round the bosom. Short silk pelisse edged with elastic velvet. Long white or black veil.